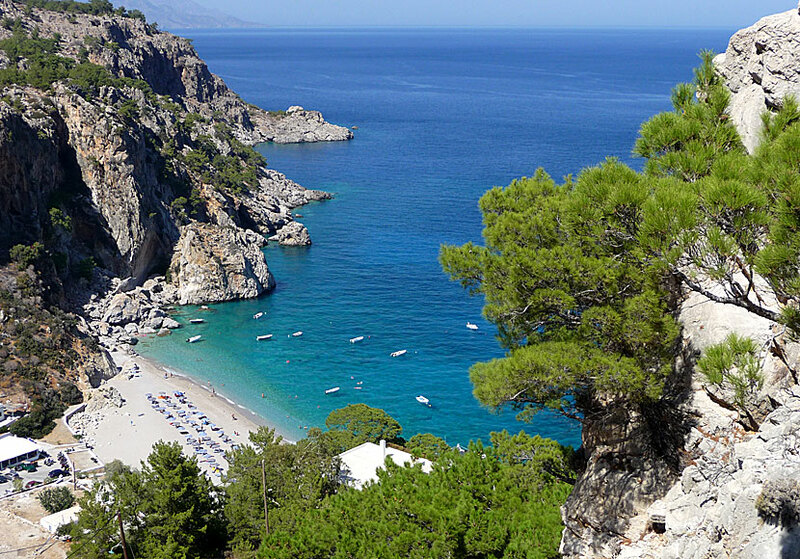 Kyra Panagia beach in Karpathos. Kyra Panagia, about 7 kilometers north of Aperi, is just like Achata beach surrounded by high mountains. From the road, the view over the beach is mesmerizing, far below between the mountains you distinguish an inviting deep blue sea and a snow-white beach. The steep road bordered with pine trees windings all the way down to the beach. Turn the engine off and enjoy, more beautiful than this it wont hardly be. The beautiful view over the Kyra Panagia beach. 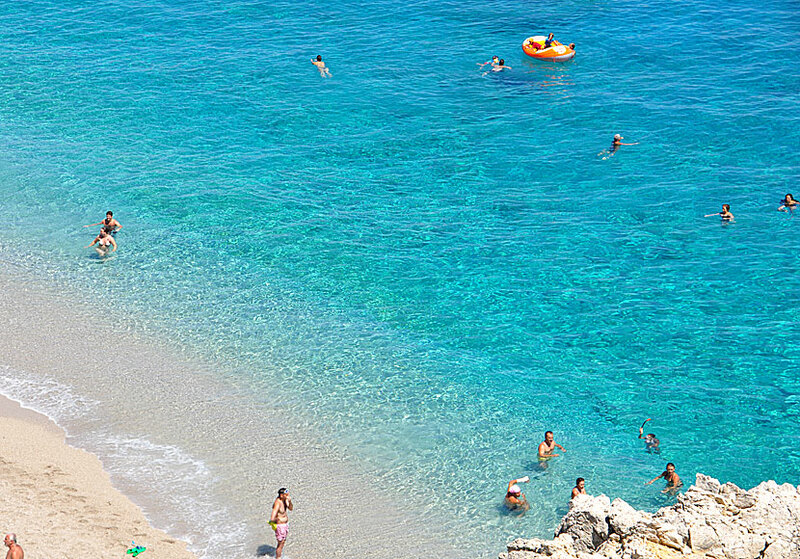 Kyra Panagia is a very popular beach. There are several tavernas, hotels and pensions. The sand is mixed with pebbles. Around the rocks to the left (where the beach boat berth) it is nice to snorkel. On the opposite side lies the church that the beach got its name from. The church was built in 1883 by a captain after he survived when his boat went down in a storm. 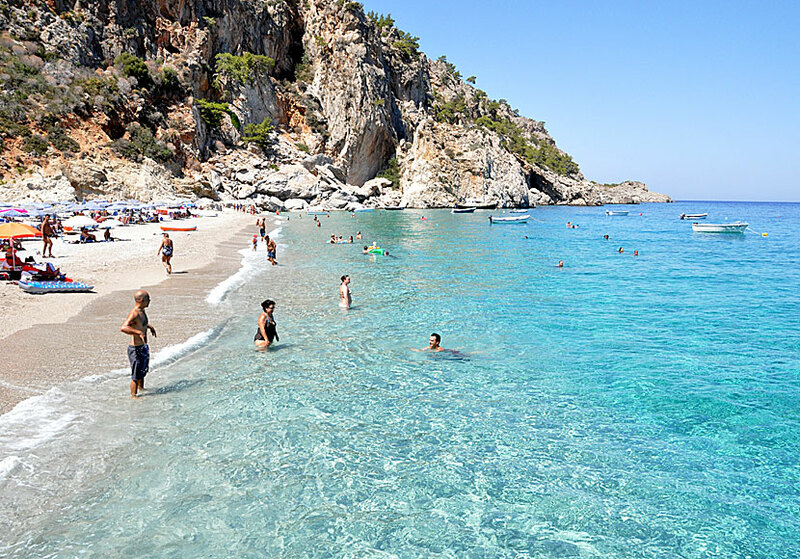 Of the four wonderful beaches north of Pigadia, Kyra Panagia is the only beach that hotels are found on. Kyra Panagia Apart Hotel is the only hotel on booking.com. The hotel has a swimming pool if you get tired of the sea. How it would happen? The wonderful water at Kyra Panagia beach.